I have a vulnerability issue! 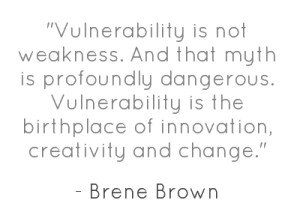 A friend shared Brene’ Brown’s video “The Power of VULNERABILITY” with me. I had never heard of Brene’ before and was curious about her message and why my friend felt inspired to share it with me. Well much to my surprise Brene’s funny and insightful presentation brought some much needed clarity. The message is about “connection” – the reason Brene’ believes why we are here is to experience and embrace connection with another. Wow! Connection! I thrive for connection with others. Connection makes me feel alive! Some of my close friends can probably recall times where I’ve said “can we talk, I’m not feeling connected.” I’m having a flashback to times when I’ve been in or was approaching that dark space in my mind and realize that those were times I felt “not connected.” So now I can’t wait to listen to the rest of her video because I think there are some gold nuggets here for me to learn more about myself. So Brene says … Shame is fear of disconnections. Is there something about me if others see it they will not want to be connected with me? Ouch! That got my attention hearing that! We live in a society where we hear a lot about bullying, drug use, not taking care of our bodies, self-mutilation and I believe each of these are about seeking something outside of ourselves because we don’t feel connected. I had never really dissected the concept of shame until I had heard Brene’s message. When I feel ashamed about those things that I don’t always like that make up who I am or when my stinkin’ thinking plays out those negative messages I believe about myself, I’m disconnected. My fear is that if others see the vulnerable side of me they won’t accept me … they won’t love me. Yet instead of seeking the deeper meaning of it being about connection I sometimes fall in the trap and revisit “my old tapes” … those tapes that reinforce the negative perceptions of myself. Makes sense because if someone shares my “negative” perceptions of me then I must be unlovable and that only leads to being disconnected? And I’ve again set myself up to disconnection because of the false perceptions that somewhere along the way I believed to be true that “I wasn’t good enough”. And if I’m not good enough then I’m of course not “enough” to be loved. And that’s the slippery slope for me that leads me to being disconnected from myself, my higher power and my relationships with others. No one wants to talk about shame. Feeling those emotions that go with shame, realizing what it is doing to our mind, our body and how it directs our lives is difficult at times, but necessary to move beyond the swamp into the light of our true potential. Realizing that we are “good enough” just as we are and believing we are worthy; that we are worthy of connection with another, that we are worthy of being loved and accepted just as we are. So Brene says … a “breakdown” can be also seen as a spiritual awakening. It takes courage to feel vulnerable, courage to become vulnerable with another, and courage to be present with another person with our whole heart – leaving no closed doors to our heart. When we find the strength to be compassionate with ourselves we can then truly be compassionate and kind to others. But it requires a willingness to let go of who we believed we were, letting go of those negatives tapes that have controlled our lives. A willingness to completely embrace who we are! 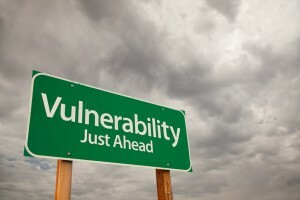 Fully embracing vulnerability is realizing that being vulnerable is beautiful, can be scary, is genuine, and originates from love ~ it’s what makes a bridge from being disconnected to being connected. Vulnerability is doing something without any expectations of the outcome like being present while waiting for news of something pressing, taking a risk doing something we’ve never done that maybe scares us, sharing our deepest pains with another person, investing in a relationship regardless of what the outcome will be … that’s being vulnerable … that’s being alive! She believes that we numb ourselves to avoid being vulnerable which means that we also ignore the reality that we have needs. Probably because somewhere along the line we were let down or disappointed by another and came to believe that our needs wouldn’t ever get met. 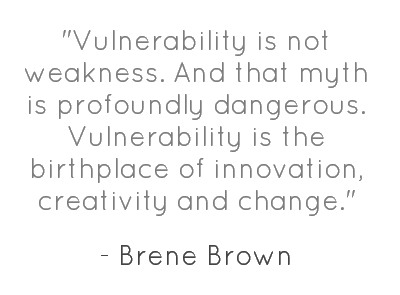 So we shut down to vulnerability and we also shut a door to fully feeling joy and creativity and belonging and love. Maybe that’s why she identified our society being the “most in debt, obese, addicted and medicated adult cohort in US history”. 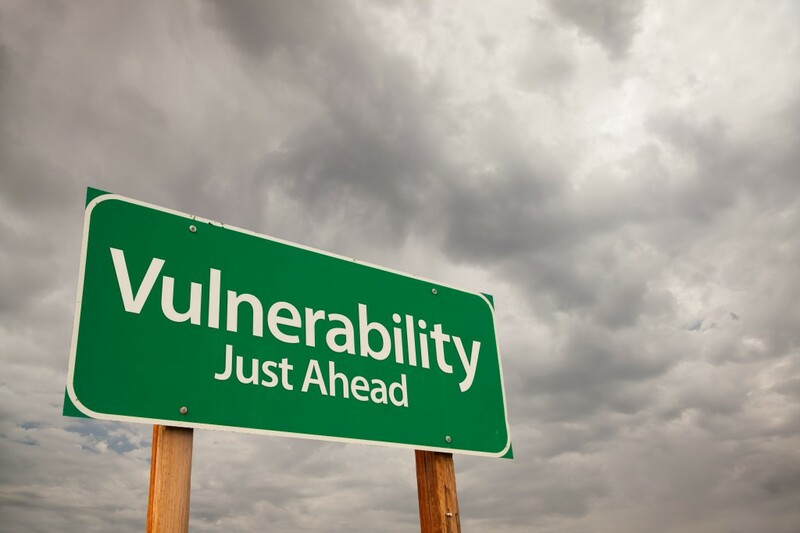 When we close ourselves to being vulnerable we then attempt to fill that void with something and generally not anything that is good for us. We’re numbing ourselves. Yet do we really believe we can be selective; that we can numb the emotions that are painful and feel the emotions that make us feel good? Anyone that believes we can feel the good emotions and shut down the painful ones is really fooling themselves. So when we close the door to vulnerability so we don’t feel the shame, sadness, hurt, we also close the door to feeling joy, gratitude, happiness and love! I wonder what life would be like if we are open to our emotions regardless if it is fear or shame or joy or love or pain or happiness … maybe then we’d stop being the most in debt, obese, addicted and medicated adults in US history and create a culture where our children will be open to being vulnerable and able to fully embrace life!